Osteen Hoaxster Explains: Goal Wasn't To Defame Pastor : The Two-Way The person behind the elaborate online hoax in which a fake website proclaimed Pastor Joel Osteen's intent to renounce Christianity and shut down his influential ministry says that his goal wasn't to attack Osteen personally. And he adds that he has now received thousands of "heartfelt" messages. 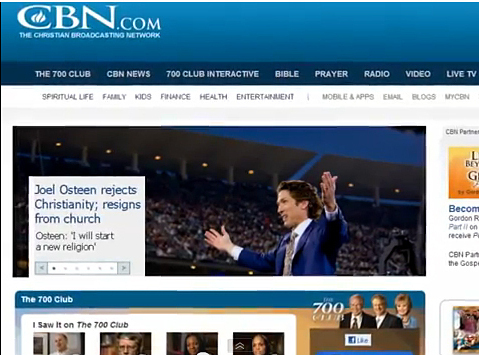 An image taken from a YouTube video depicts a mock news story on the Christian Broadcasting News site, claiming that Pastor Joel Osteen had renounced his faith. The person behind the elaborate online hoax in which a fake website and Twitter feed falsely proclaimed Pastor Joel Osteen's intent to renounce Christianity and shut down his influential Houston ministry says that his goal wasn't to attack Osteen personally. "I would like to state unequivocally my intent was not to defame Mr. Osteen," the person behind the hoax wrote in an email, adding that "he seems like an infectiously nice and genial character." As we reported Monday, the hoax relied on news site mock-ups, a YouTube video, a fake Twitter feed, and a fake website to trumpet the spurious claim that Osteen had decided, after much reflection, to step away from his church and donate millions of dollars to charity and environmental causes. "My hopes that Joel will 'see the light,' so to speak, are not high, but we all need faith," says the man who created the hoax and wishes to remain anonymous. As for his motivation, the man, who says he hasn't made any money from the Osteen project, says that his "intent was to stage, for a moment, a plausible scenario of his hypothetical resignation" and to "test viral media markets," in addition to sending a message to Osteen. Answering questions via an email account tied to the fake Osteen website, the creator of the hoax says he has seen an "extraordinary" amount of coverage in online and TV media, despite the story taking longer than expected to go viral. And he says the hoax also generated strong public responses — many of them positive. "I've received thousands of heartfelt, often revealing and deeply sincere messages from wonderful Christians and non-Christians alike, along with a few grumps and party poopers thrown in for good measure," he says. As for Osteen, the man behind the hoax says he wants the pastor to "do away with the soft 'positivity' and cliche-peppered Sunday messages and use his high visibility to address more serious social issues." As stated in the fake resignation letter, those issues include protecting the environment, banning fluoride from water, fighting the Obama administration's "attempt to dismantle the 2nd Amendment," and "exposing the crimes of the Monsanto Corporation." The fake Osteen website was essentially a mirror of the real thing, with two main differences: a missing "e" in the URL's spelling of Osteen, and a letter purporting to be from the Houston-area pastor, informing his congregation that Lakewood Church was losing its leader. The fake site also included a feedback form and an email address. And the person behind the hoax says many people responded. "About 60 percent of literally thousands of comments and emails have been positive, affirming messages from Christians praying for me," he writes. The remaining 40 percent was evenly split between "very angry, upset Christians" and "atheists and freethinkers and 'back slid' Christians," he says. Many in that final group took to "telling me stories of their struggles of persecution for 'not believing,'" he says. "I feel I actually gave some comfort to these people, to see a man of such stature admit such sobering, if not politically incorrect, thoughts." Osteen, whose authentic Twitter feed may have inadvertently put the spotlight on the hoax by denying rumors of his crisis of faith Monday, was somewhat amused by the incident, ABC News reports. "You know, I'm really not angry. I don't feel like a victim," Osteen tells ABC. "I feel too blessed, that life is too short to let things like this get you down." Still, it remains possible that the hoax could generate legal proceedings against the person behind it. "I could end up being in a lot of trouble," he wrote, "but I am prepared and I have excellent legal counsel ready for battle." As for the time and expense that went into the hoax, the man says he "spent $12 and a few hours to produce this whole thing." And he added that he does have another goal, in addition to those mentioned above: "to somehow appear on The Daily Show so I can make one of my good friends jealous."